January 17, 2016. Matthew and I returned exhausted to Oslo from a trip back home to Chicago. Nothing like 16 hours in flight (including layovers) to make you long for your bed. In an effort to overcome our jet-lag-induced torpor, we heeded the experts’ advice to go for a walk in the sunlight. However, we didn’t expect much in the way of entertainment, as everything — and I mean everything — is usually closed on Sundays. So we were shocked to find ourselves eventually merging into a mob of Norwegians headed towards the palace. Check out the ski trails for more serious skiers, marked with pine branches, Norwegian flags, and ski poles. 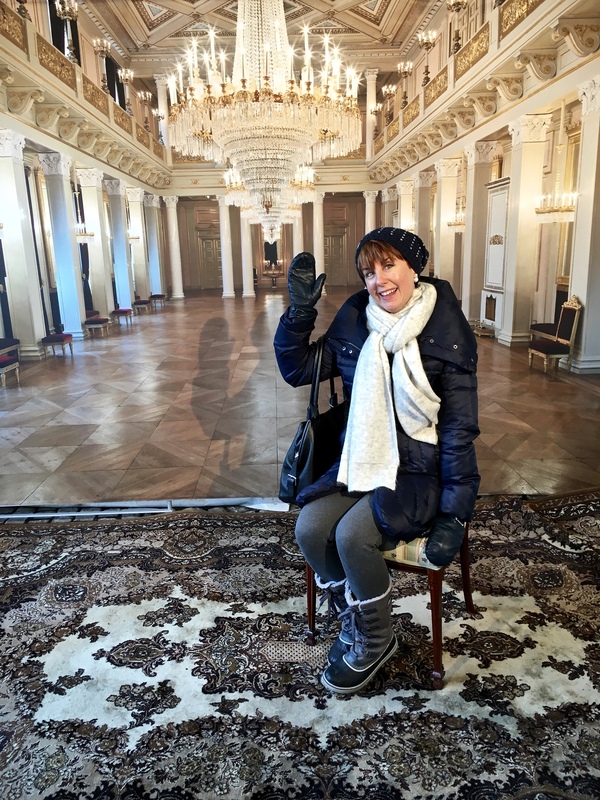 We arrived to find that the palace grounds had been transformed into a winter wonderland. 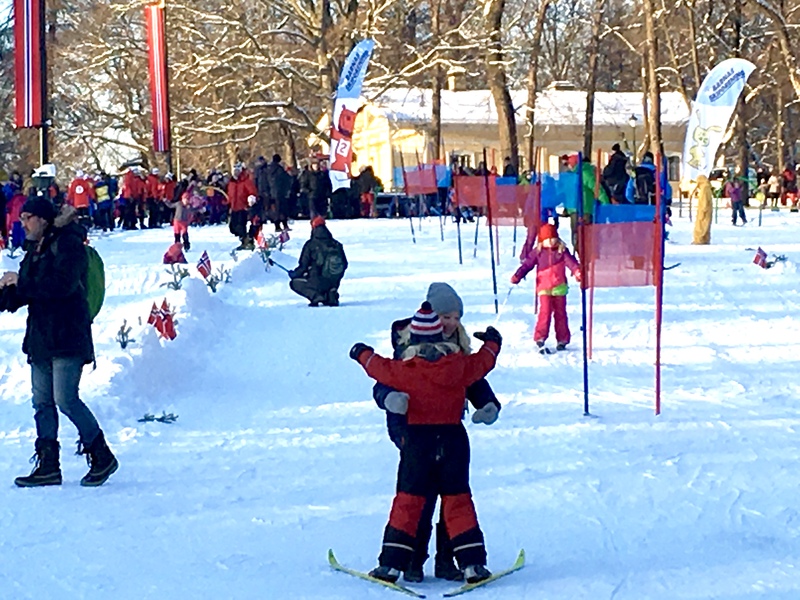 Norwegian flags and pine branches marked the layout of cross-country skiing trails complete with hills and moguls. Looking a bit like Emperor Penguins shepherding their chicks, parents zoomed down the steep spots with their little ones nestled between their legs. For the more practiced youngsters, a pathway defined by colorful, balloon-festooned archways beckoned. What king wouldn’t want kids performing ski stunts in the front yard of his palace? 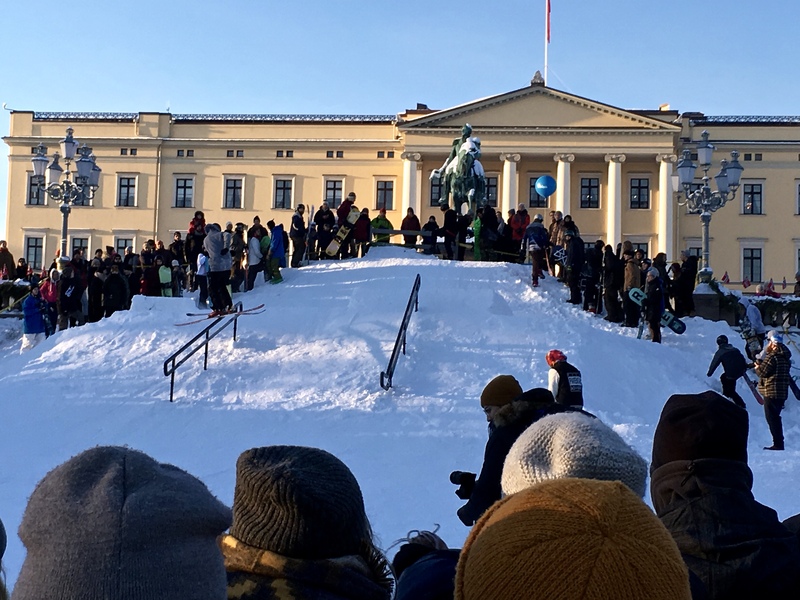 In front of King Karl Johan’s statue, a mound of fluffy white stuff — piled high and freshened up by the previous night’s snowfall — hosted a horde of boarders and ski jumpers. Loudspeakers broadcast each newly attempted trick, as kids launched themselves from the top of the snow-covered stairs to spin in the air and screech down icy handrails. For the truly adventurous, laser rifles offered the chance to practice biathalon skills, while an ice slide provided fun for those who didn’t come equipped with their own skis. Three-year-olds careened down the hillside through a series of colorful balloon archways. Check out this guy boarding down the handrail. Families brought their own fur-covered sleds for the little ones. Check out the skier on the left in mid flip. 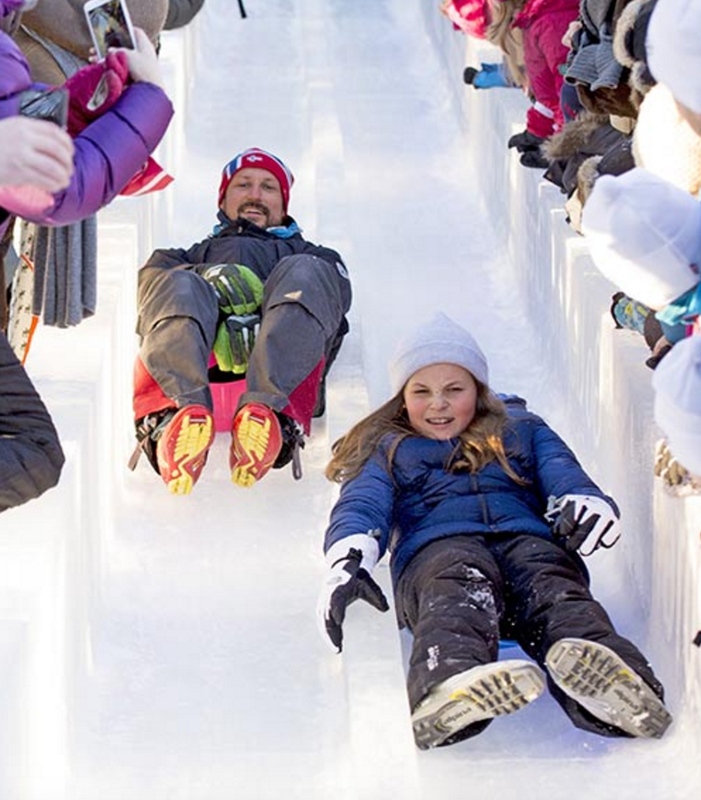 Crown Prince Haakon and his daughter Princess Ingrid Alexandra take to the ice slide. © Rex from Hello! magazine. So what was the occasion? After asking around, we discovered that it was King Harald V’s Jubilee — the 25th anniversary of his ascendancy to the throne of Norway. 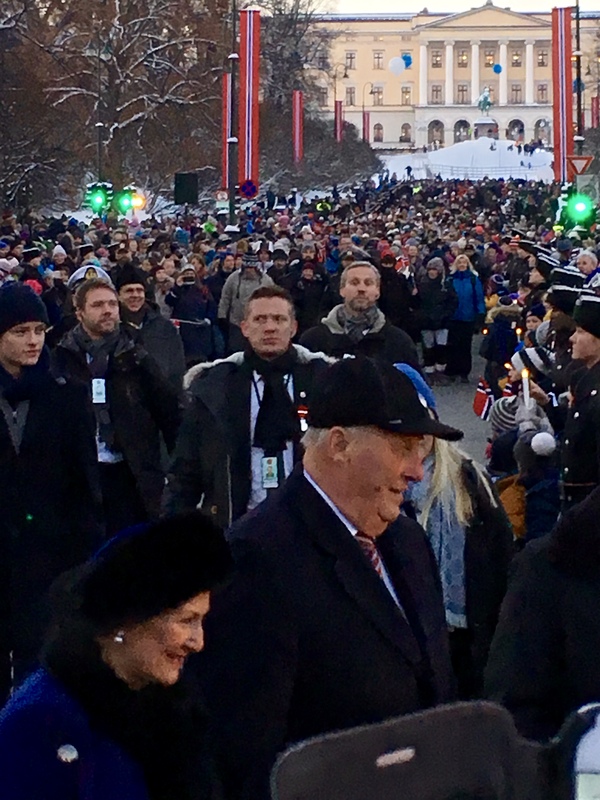 To celebrate, he and Queen Sonja had requested that the Norwegian Olympic and Paralympic Committee and Confederation of Sports host a big ski shindig in the front yard of the palace. As usual, the laid-back, non-stuffy royal family had joined in on the fun, taking to the trails, trying out the ice slide, and generally hobnobbing with the regular folk who’d come to wish them well. 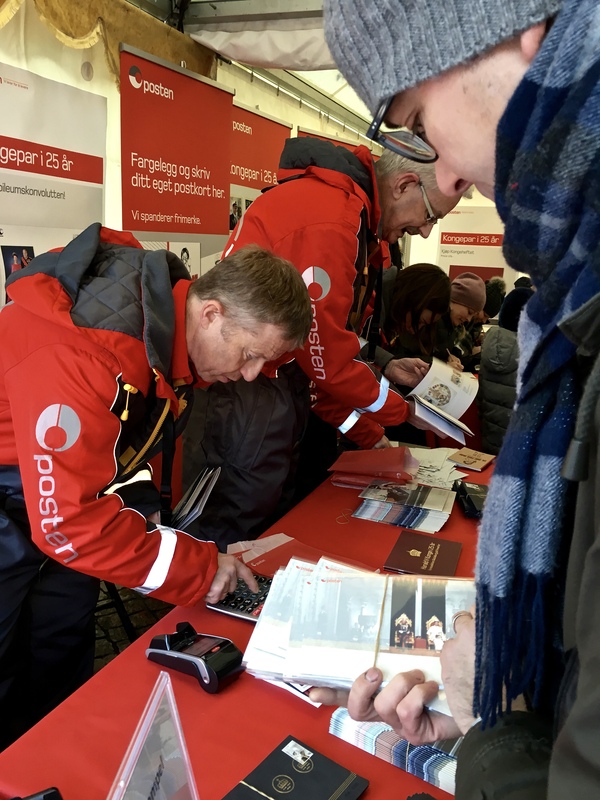 Matthew checks out the jubilee memorabilia offered by the Norwegian post office. Not having dressed appropriately for rolling around in the snow, we watched everyone’s antics a bit, then wandered further along Karl Johann’s Gate. (By the way, Gate is pronounced “GAH-tuh,” and it means “street.”) Big tents erected in front of the University held opportunities for the kiddies to craft their own crowns, pose in front of a photo mural of the Great Hall, collect special jubilee postmarks, or offer felicitations to the king and queen in a guest book. I’m practicing my “screw in the lightbulb” wave taught to me by Queen Elizabeth. Matthew and I declined waiting in the long, cold line to sign the guest book, but I did practice my queenly wave at the Great Hall photo op, and we collected some stamps for Matthew’s sister, who’s a philatelist. (The word means “stamp-collector,” but doesn’t “philatelist” sound so much more deliciously naughty?) We eventually made our way to the food shacks for some mooseburgers, reindeer stew, and other warming Norwegian delicacies, and settled down to watch some of the musical acts on the big stage. Queen Sonya and King Harald passed right by Matthew on their way to the concert. The king, queen, and entire royal family promenaded from the palace to the University’s concert hall. A strapping young member of the Kongens Garde. Yep, “Kong” means “King,” so now you get the joke of King Kong, right? Performers include Norwegian Bluegrass, traditional singers, and Norwegian boyband rap artists. 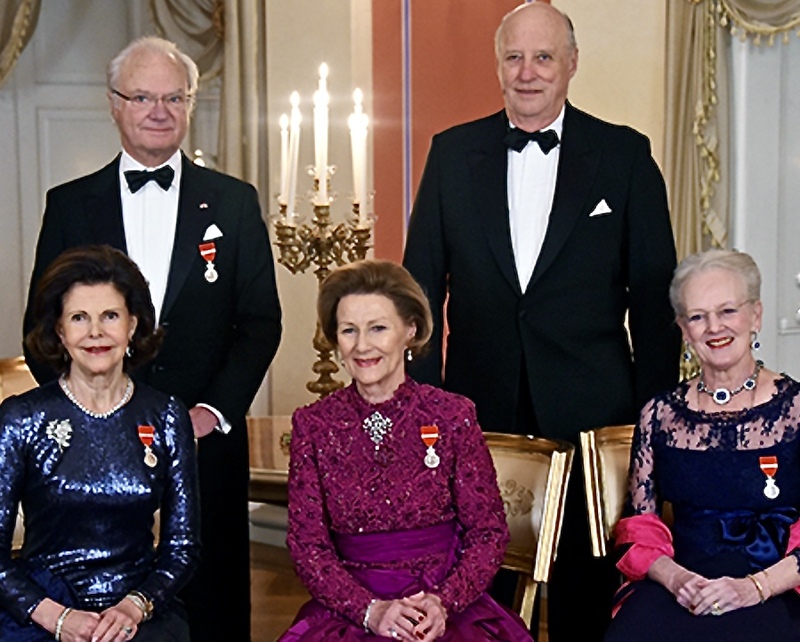 The Scandi royals all joined in for a gala dinner, including Sweden’s King Carl XVI Gustav and Queen Silvia (left), Norway’s King Harald and Queen Sonja (center), and Denmark’s Queen Margrethe (right). Photo: Sven Gj. Gjeruldsen, The Royal House of Norway. Harald (then Crown Prince) and Sonya on their wedding day. Photo: Royal Order of Sartorial Splendor. I think my favorite story was the one about Crown Prince Harald’s courtship of Sonja. He met her in college — in fact, he was the first Norwegian royal to attend public schools — and they dated for nine years before he was able to convince the Norwegian people, his father, and the Storting (parliament) to allow him to marry a commoner. Remember, this was the 60’s, long before Prince Charles married Diana and folks became adjusted to the idea of royals “marrying down.” Apparently the clincher was that Crown Prince Harald threatened to remain unmarried forever if he wasn’t allowed to wed Sonja, which meant Norway would have to look elsewhere to secure the succession of the throne. 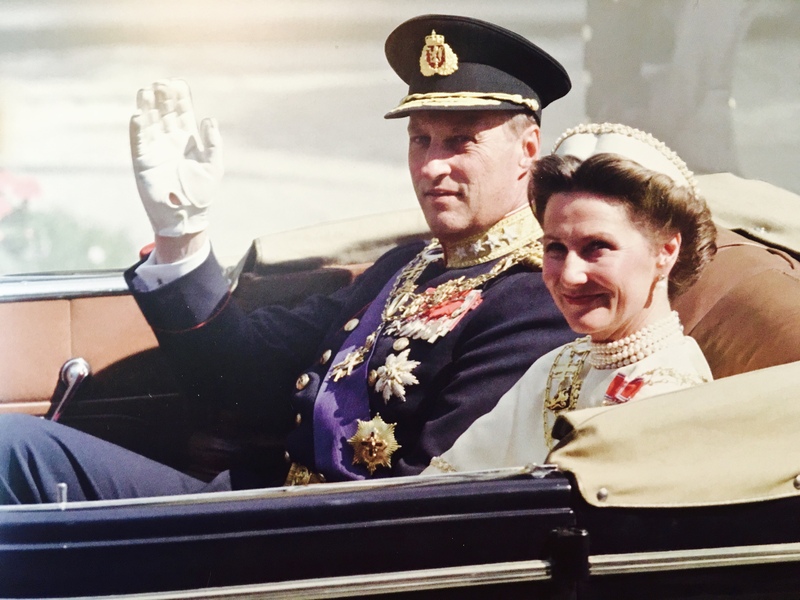 King Harald and Queen Sonja on Coronation Day, 25 years ago. 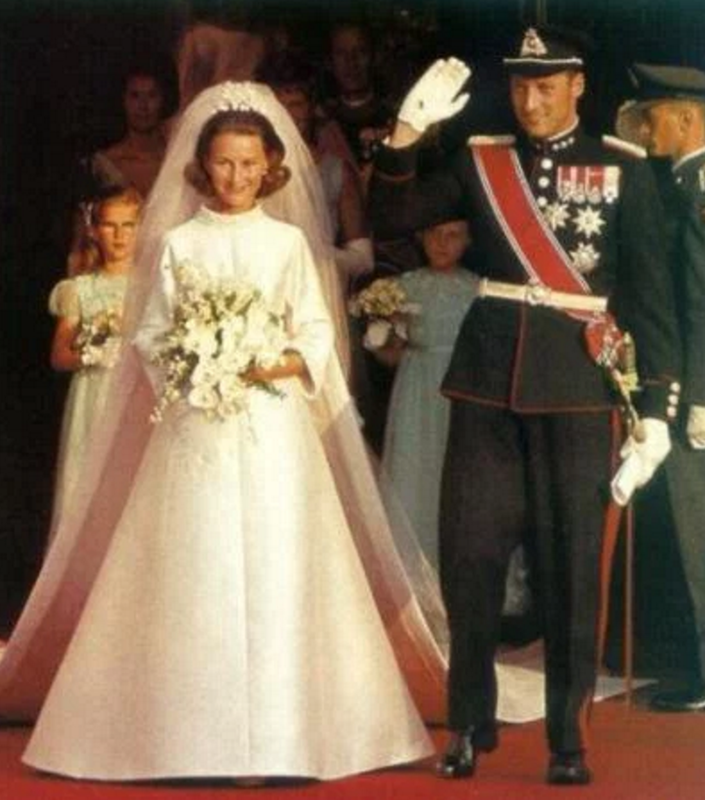 The ploy worked, and the two were wed in 1968, with Harald’s father, King Olav V, escorting Sonja (whose father had died) down the aisle in a demonstration of his support of the marriage. King Olav himself died of a heart attack on January 17, 1991, leaving Harald and Sonja to ascend to the throne. In the end, the entire experience probably helped the royal couple deal with their own son’s eventual decision to marry a commoner initially disliked by the public. Funny how history repeats itself. 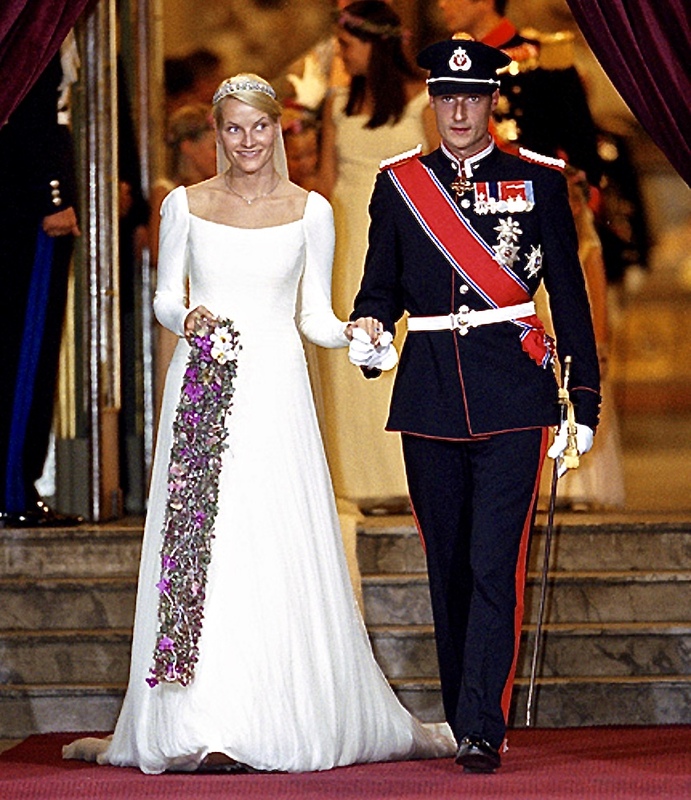 The wedding of Crown Prince Haakon and Crown Princess Mette-Marit. UK Press/Getty images. In any case, Queen Sonja stepped up to the plate, championing her soon-to-be daughter-in-law and working with her to teach her all that is necessary to be queen. In one interview, Queen Sonja recalled how terrifying it had been for herself to enter a palace dominated by men, with no previous training on how to be a royal, and no woman to show her what was expected. (Her mother-in-law died before Sonja met Harald, and her sisters-in-law were long married and living elsewhere.) Which is why she wanted to ensure her future daughter-in-law didn’t go through the same rough initiation into royalty.